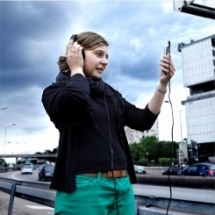 CityTelling provides a set of services and digital devices for city storytelling to public authorities, cultural institutions and urban stakeholders. We create and develop tailored applications, adapted to your technical environment and your users needs, in the fields of urban tourism, heritage mediation and valorisation, urban development and citizen participation. Based on an innovation iPhone app, Heritage Experience allows you to explore the territory in a sensitive way and to access to a wide range of geolocated audiovisual contents in mobility (archives images, interview of the area users, views of experts, residents stories...). Throughout the walk, the iPhone app compiles the contents based on the user's motion and behaviour, providing a true narrative of the territory. 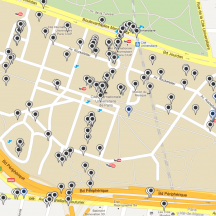 Web or mobile cartographic application, SmartMap can be developed for any territory, from a neighbourhood scale to a city scale. The SmartMap aims at promoting the emergence of a collective, emotional and shared vision of the territory. The project invites visitors and users to reclaim and rediscover their recreational, visit, discovery and work spaces. Urban Explore's mobile app provides a new way to exchange on and read the territory. 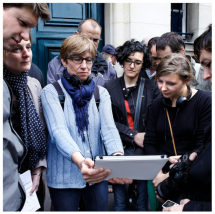 With digital tablets on hand, the public explores the city, guided by a speaker speech. Citytelling leads to a series of experimentations in the south of Paris, developped in the frame of SmartCity Living Lab - Laboratory for urban innovation on the creative and sustainable city - in partnership with the Cité internationale universitaire de Paris.